After three years of legal battles, VTA drivers say they are underpaid and overworked. Vineyard Transit Authority (VTA) bus drivers, concerned about low pay and high stress, are working with a union to negotiate a contract with the drivers’ parent company, Transit Connection Inc. (TCI). TCI runs operations for the VTA by hiring, training, and scheduling drivers, dispatchers, and fuelers. VTA drivers have not joined Amalgamated Transit Union, the nation’s largest transit union, but voted to allow the union to negotiate a contract on their behalf. The negotiations come three years after a lengthy legal battle following the VTA drivers’ initial attempt to join the union, which failed after the drivers voted against it, 21-18. In January 2015, TCI declined to recognize the union as the drivers’ representatives. The National Labor Relation Board then supervised an election for the drivers on joining the union. The labor board required TCI to give the union a list of drivers who could vote, and their addresses. The union sent out envelopes, complete with campaign literature, and information on a March 2015 meeting prior to the vote. Issues arose several days after the vote, when 22 of the 39 envelopes were returned, marked with “not deliverable as addressed,” according to a 2017 court report. The 39 addresses TCI gave to the union were mostly residential address obtained from employee driver licenses, not mailing addresses. Living on the Island, the majority of VTA drivers use a Post Office box to receive their mail. When the union sent out the envelopes, many came back as undeliverable. After the failed vote and the undelivered envelopes, the union filed an objection with the labor board, which, after a hearing, vacated the March voting results and ordered a new election. Even though the September election results were allowed to stand, TCI refused to bargain with the union. This forced a review of the union’s certification. The union then filed an unfair labor practices charge against TCI. The resulting legal battle dragged on for several months until March 2016, when the labor board certified the union as the drivers’ representatives. The union then demanded to bargain with TCI in August 2016, but TCI failed to respond, resulting in another long courtroom battle. Last April, the U.S. Court of Appeals for the 11th Circuit ruled that TCI had engaged in unfair labor practices when it refused to bargain with the union, and ordered TCI to negotiate with the union. The 11th Circuit had jurisdiction over the case because TCI also conducts business in Florida. A group of VTA drivers met with The Times to discuss their intentions and what they want out of negotiation talks. Richard Townes, John Christensen, Roland Goulart attended, with several other drivers who asked not to be named because they fear retribution. “It’s not safe. We’re concerned about our safety, we’re concerned about the hours that are being worked,” Townes, a member of the VTA drivers’ council who has been vocal in his support to join the union, said. In a meeting between the council and TCI general manager Darren Morris, the council asked to have an accident review board to look over accidents. “Us drivers don’t have any protection,” Goulart said. The review board never came to fruition, and Morris did not show interest in scheduling meetings. “We met one time,” Townes said. Now that TCI has been ordered to negotiate with the union, the union has asked for dates to meet and negotiate a contract. TCI, along with its legal representatives, has pushed back negotiation dates until after Labor Day. The drivers are asking for better pay, factoring in seniority when choosing shifts, and improved working conditions, among other demands. Starting pay for VTA drivers with a commercial driver’s license training is $17 an hour. Starting pay varies at other transit authorities in the state. 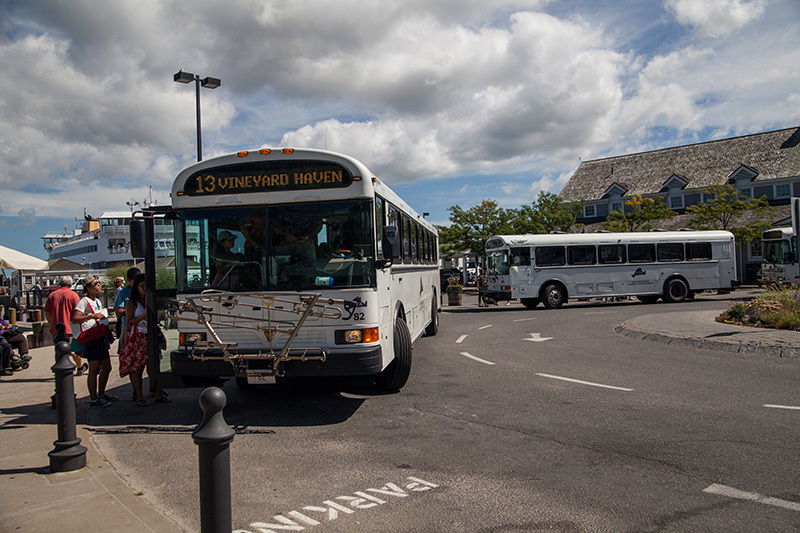 The Cape Cod Regional Transit Authority offers $16 starting pay for drivers, while Valley Transportation Services, which operates the Nantucket Regional Transit Authority, offers starting drivers $21 an hour, according to each transit authority’s website. After a string of incidents this summer involving one VTA driver fired for making a racist comment and another leaving the job after hitting and injuring pedestrians, VTA drivers are concerned about their well-being and the well-being of the customers who use the buses every day. “It’s not safe. We’re concerned about our safety, we’re concerned about the hours that are being worked,” Townes said. Last week, VTA administrator Angie Grant declined to comment on the VTA drivers and the union, instead referring The Times to TCI for any questions. Multiple messages left for TCI were not returned. After the July incident of pedestrians being struck by a VTA bus, the union issued a statement offering sympathies to the victims, but also warning of the dangers if changes to management are not made. “Low pay leads to driver shortage, which leads to long hours of those on the job, which leads to an exhausted workforce on Vineyard roads.That’s dangerous for all of us. The VTA is our public agency, and a large part of what keeps Martha’s Vineyard moving. But for too long, it and TCI have taken risks with the safety of employees, riders, and all those who share the roads with us. We must hold them accountable to creating a safe and secure working environment for transit workers, providing reliable service to riders, and honoring industry-wide safety standards so that no one else is hurt or worse,” the union statement said. “The reason we asked the union to represent us is because [TCI was] not following their policies,” Townes said. Why does the VTA not operate it’s own business? Because then VTA must bear directly the expenses of hiring, training, and scheduling drivers, dispatchers, and fuelers; all this would increase fares for riders. Instead, they’re piggybacking TCI’s existing operation. In other words, the VTA uses TCI to insulate from the realities of what it really costs to do business here. If fares must increase, then so be it. If you hire a man to work full time in a job like transportation you should be prepared to pay a living wage. I tried to get the post office to deliver my street address mail to my po box. Seems they just arent that advanced yet. all my mail was sent back to sender. So I had to live with just using a po box. In Massachusetts it’s illegal for a regional transit system to operate the buses. The law was in response to the political cronyism abundant at the MBTA . Great! So the problem is legislatively created – maybe we need a little swamp draining here in Massachusetts. You may be right. Our local politicians cannot even select a police chief on their own, much less run a SSA or a VTA. VTA has created incredibly unsafe conditions on our roadways with drivers working over 70 hours a week. The legal limit is 60. They offer no employee health insurance for families. Very few holidays , drivers work Memorial Day, July 4, Labor day, Columbus day for regular pay. The starting wage is about the same for dishwashers on the island. The VTA Board of Directors who are against living wages and decent benefits for drivers are Alice Butler, Oak Bluffs, Lenny Jason, Chilmark, Louis Paciello, Edgartown, John Alley, West Tisbury, Jay Grande, VH, June Manning, Aquinnah. When you see them in public call them out and ask why they don’t support a decent wage for hard working islanders. This board has spent over $70 k in taxpayer money to protect TCI, a private company from negotiating with the union. The management failures at the VTA is comparable to the recent SSA foibles on steroids! Put another way, taxpayer dollars have been spent to enhance the profits of an off island business, at the expense of people working on the island. The populist movement may be slow getting started here, but it could be ugly when it does. If these hourly wages are correct, they are ridiculous.They are driving Islanders and summer folk. Their minimum wage shouldn’t be below $20 per hour and they should receive benefits and paid vacation. They are ambassadors for the Island. It is always the front line that earns the least, just like bank tellers and other people that work representing the Island. Starting wage is comparable to what a dishwasher makes. Very limited benefits and very limited holiday pay. Meanwhile the VTA employees enjoy incredible benefits – family healthcare, every imaginable holiday , pensions, you name it, they get it. Drivers get a 50 cent an hour raise each year and it takes them 12 years to reach maximum earnings. Disgraceful.